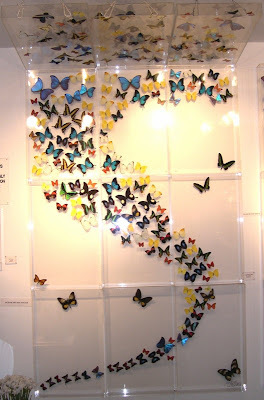 A few weeks back I did a post on making butterflies out of maps - not a hard project, but it can be time consuming to trace and cut butterfly silhouettes. 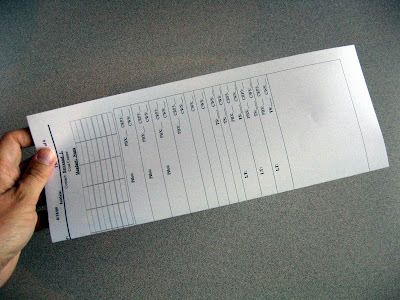 Sarah over at The Estate of Things suggested a Martha Stewart butterfly-shaped paper punch from Michaels. 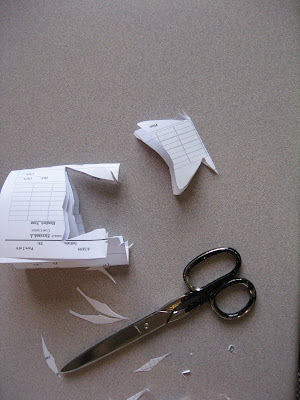 But if you want to mass produce butterflies on the cheap, another option is the cut and fold method. 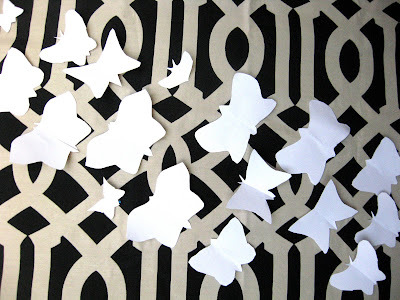 But first, why would you want to make large quantities of paper butterflies anyway? For one thing, it's a fun way to reuse interesting paper - stationary, a remnant of wallpaper, the Magna Carta - by turning it into wall art. 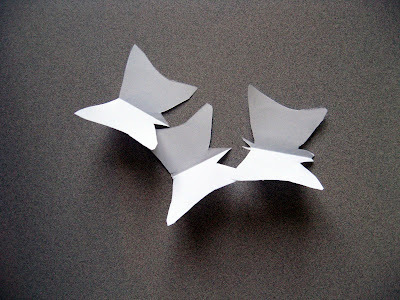 For inspiration, consider Paul Villinski's famous beer can butterflies, a stunning reuse of a pedestrian product. 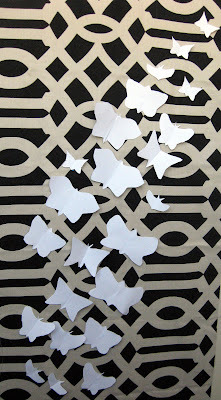 So here's the quick and easy way to make hundreds of butterflies, demonstrated with used office paper. 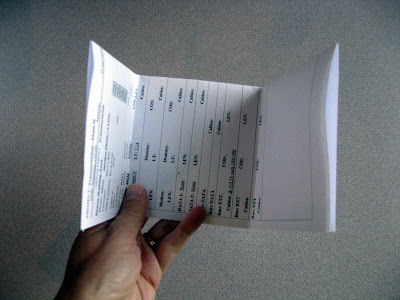 Fold in thirds or fourths, depending on the size of your butterflies and your paper. Voila. A bunch of butterflies. Make more of varying shapes and sizes. You can stick them to the wall using thin wire and glue, pins, push pins, or my favorite ghetto adhesives - scotch tape or painter's tape. I just went trolling the local AC Moore for some of the feather floral butterflies, with no luck. I suppose I should bite the bullet and just make my own! how can i stick without damaging the wall ??? + after some weeks the tape will wear off :( won't it ?? ?